Volunteer Appreciation Day a Huge Success! 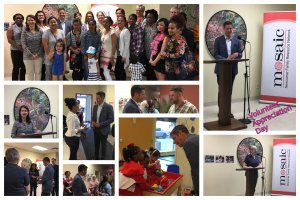 Mosaic Newcomer Family Resource Network would like to thank everyone for attending our Volunteer Appreciation Day on June 19, 2018, at our downtown office location at Mosaic, 397 Carlton Street. Seeing each of you there and having so much support made the event successful and memorable. Our thanks and appreciation go out to the special guest Mayor Brian Bowman. Your visit was a compliment to everyone in our office. We wished we would have had more time to talk, but perhaps that will happen another day. Thanks for your kindness and generosity. We also would like to thank our other guests who shared the time with us: all of our volunteers, students, and staffs. It’s great to be in Mosaic!! !